Back To The Beach 2019 is heading to Huntington State Beach in Huntington Beach, California on April 27 through April 28, and will bring some amazing friends to have some fun in the springtime sun. The Travis Barker and John Feldmann presented music festival will celebrate its second year with scheduled performances by blink-182, The Used, Goldfinger, The Story So Far, Reel Big Fish, and so many more. It certainly sounds like a fun time to hit the beach with your family as kids under the age of 10 will also be able to attend for free, with purchase of adult admission of course. Tickets for the Orange County hosted music festival will go on sale this coming Friday, April 25 @ 10 AM. Ticket packages will also include VIP Lounge and Private Beach Cabana options for either single day or weekend experiences. 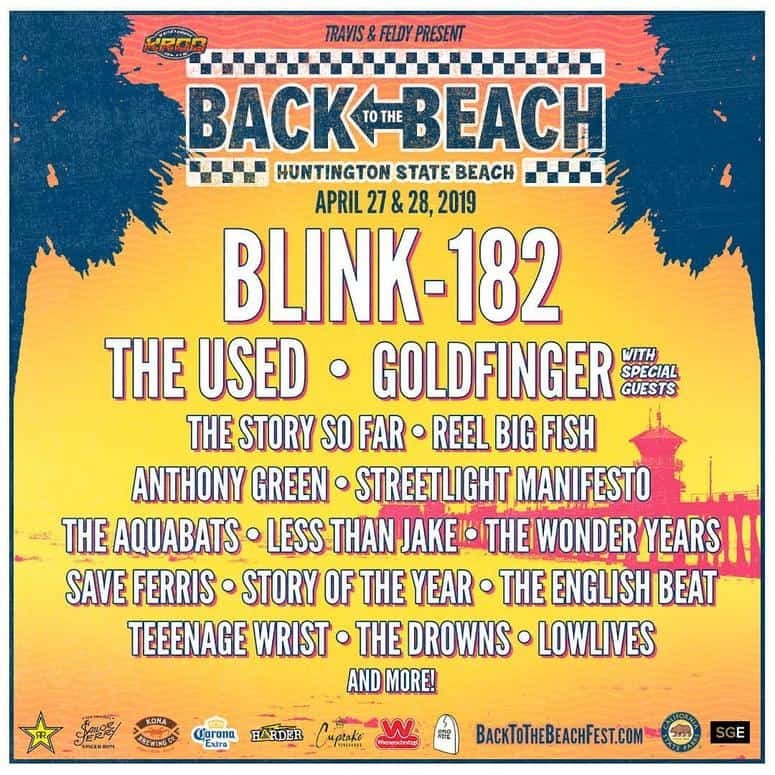 When talking about the 2019 Back To The Beach music festival, festival producer John Reese stated, “We are so excited to have blink-182 as part of this year’s event. A huge thank you to California State Parks for having us back for another year. We couldn’t ask for a more beautiful venue with a more perfect lineup.” I couldn’t agree with John more, the lineup for this year’s Back To The Beach seems incredible, and you can find a breakdown of which band’s will be playing which days below.